the ironic male knitting project, and somehow in the messy learning I added stitches. Don’t ask me how, it just happened. So I kept going, added fringes to disguise the “mistake” and made it a scarf for my daughter. 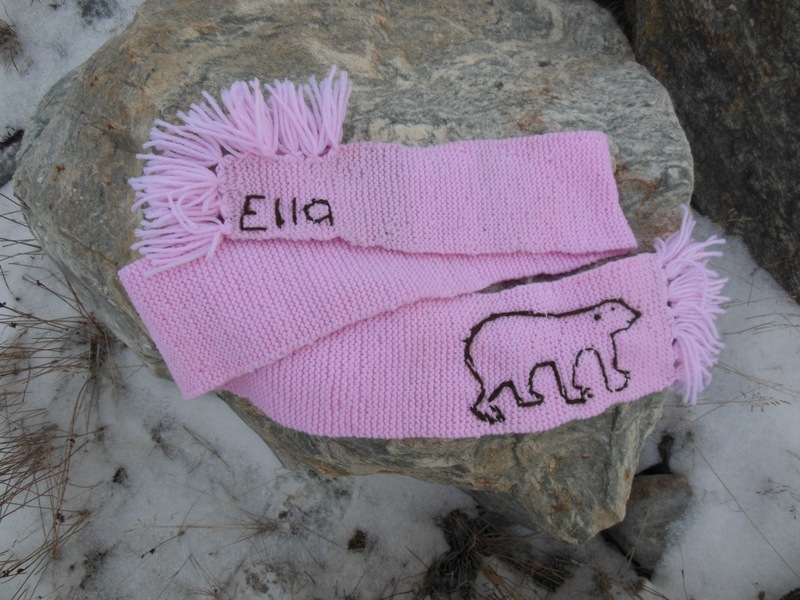 I sewed / embroidered her name on the shorter side, and a polar bear on the other side. Don’t ask why the polar bear is brown… Brown and pink go so nicely together. I sent it off last Monday, so it should arrive next week sometime, maybe this week if we’re lucky. 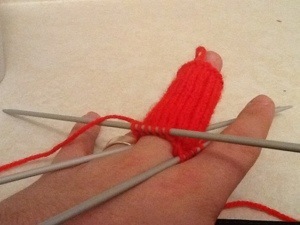 My next challenge was to learn to purl stitch. But my next project was a scarf for me! No knit one purl two for this manly scarf! I wanted it to be warm so my mom sent some wool she got in Scotland! Thanks again mom! I now realize how addictive this hobby can be. Oma would be proud. Sweaters for everyone at Christmas now seems like an amazing feat, eh? Keep knitting!! I’m a ways off from sweaters, but I think it’s on the list of to do. At least one character themed one for Ella! I’m definitely impressed with the four needle first project! Oh and the wool was from Ireland. I do however want to visit Scotland Maybe next year! Wow I’m impressed! I think Ella will love it!